A coalition of some Civil Society Organizations in the country has demanded immediate resignation of the Senate President, Bukola Saraki, following his links to the alleged Offa banks robbery and gang leaders’ confession, non declaration of his assets and the killings of over 33 people in Kwara State by political thugs. 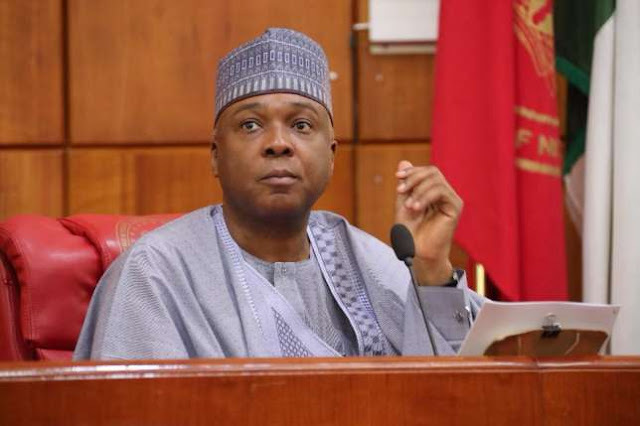 The group under the aegis of Coalition of Civil Society for Good Governance and Democracy, which also recalled that Saraki’s corruption trial with the Code of Conduct Tribunal, CCT, over his alleged non assets declaration was still ongoing in the anti-graft court, insisted that the path to honour for the Senate President was to step aside to clear his name. Addressing the media, Friday, in Abuja, Convener of the group, Alhaji Adamu Kabiru, who led other groups comprising labour unions, trade unions and Joint Action Committee, JAC, to the event, tasked members of the 8th Senate to do the needful by immediately impeaching Saraki as the Senate President should he fail to resign, saying such development would bring sanity and restore the lost glory to the upper chamber of the National Assembly in particular and Nigeria in general. The group which regretted that Nigeria has become a laughing stock in the international community because of the many corruption cases involving its number three man in government, accused the Senate President of seeking revenge against President Muhammadu Buhari and some appointees in the crime and anti-corruption agencies. It accused Saraki of leading the National Assembly to threaten President Buhari with impeachment following his latest problem with the Nigeria Police. “For Dr Saraki to have threatened President Buhari with impeachment only because the police rightly invited him is the height of arrogance, and abuse of office and disrespect for the rule of law. “It is therefore, our considered view that the President of the Senate be impeached immediately and until this done, he will continue to hold to ransom the entire country and her development, “Kabiru said. “We are gathered here to affirm that for good governance and democracy to thrive, Saraki must excuse the Senate as their president and face his multiple criminal cases ranging from, financial crimes, to abuse of office, robbery, non declaration of assets and sponsorship of militia in Kwara State. “I am constrained to bring to your notice that the police has invited the Senate President to offer clarifications on the level of his involvement with the Offa robbery and allegations of arms purchase to militia. “To this end, how then will Dr Saraki continue to stay in office as President of the Senate? It has never been this bad for our country,“ said Alhaji Kabiru, who led Mrs Sharon Ngozi Okpara from trade unions, Bisong Jonathan from labour unions and Femi Abbas, representing the Joint Action Committee, JAC, to the conference. In a prepared text Kabiru read to newsmen, the group accused the Senate President of masterminding recent National Assembly joint session where a 12-point resolutions was reeled out with the threats of impeachment of the president should he failed to adhere strictly to them. He said, “To worsen the situation and to the greatest dismay and disappointment of Nigerians, the Senate President a few days ago masterminded a joint sitting of the National Assembly to muster and nurture the impeachment of President Buhari. He led the joint sitting to reel out a number of conditions for the president to avert imminent impeachment, this is the height of folly, immaturity, mischief, treason, callous and gross abuse of office by Dr Saraki. He spoke further, “We hereby affirm that Dr Saraki forthwith resigns as president of the Senate or risk impeachment. “Failure on the above before June 12 2018, we shall mobilize Nigerians across the country to occupy the National Assembly until Saraki is impeached for gross abuse of office and financial impropriety as well as criminal charges pending against him. “That Dr Saraki withdraws and apologizes to Nigerians for the fraudulent and selfish resolutions reeled out at the joint sitting of the National Assembly for self seeking benefits. “That Inspector General of Police immediately commence the process of arraigning Dr Saraki before a competent court to defend his criminal allegations. “That President Buhari should not honour any of the resolutions of the joint sitting of the National Assembly. "That President Buhari should prevail on the police and security agencies to thoroughly investigate Dr Saraki, failure to do so, we shall mobilize Nigerians to occupy the Aso rock villa on June 12.2018 until Saraki steps aside from the seat of the President of the Senate. “That the President should henceforth seize further negotiations with Dr Saraki and his gang of saboteurs as this act of statesmanship from the President is emboldening him to take the country for his father’s estate. “We are resolved on a petition to the ECOWAS parliament, European Union, UK parliament, US Congress and United Nations to beware of Saraki and his cohorts. Kabiru further spoke, “This is a man who is the number three citizen of our country, he is aware of the core and prime policy direction of this administration: anti corruption fight. But for his indepth desire to sabotage President Buhari administration, he has turned the other way. Every day a senator is involved in criminality, the president of the Senate comes readily to his defense. “Only recently, the Senate President instigated some of his loyal colleagues to harass the person of the Inspector General of Police, and denigrate the entire institution of the police, under Saraki’s leadership. There’s been a ban on confirmation of nominees from the executive, under his leadership, certain circumstances and compromises must be advanced otherwise, no confirmation, no legislative duty including budgeting is done. “This is evident in the inability of the National Assembly to pass this year’s budget. This is sadly the situation of Nigeria and their country with Saraki as Senate President. “As if this retinue of garbage was not enough, only a few weeks ago, the country was greeted with the news of the most gruesome robbery attack in the last 20 years, where over 39 Nigerians lost their lives including police officers and pregnant women, in Offa town of Kwara State. Sadly, very sadly enough, investigations of the Nigerian police had established links of the arrested gang members with Dr Saraki. “Our legislature has never had it this bad. The leadership of the 8th Senate purely is in the hands of a wrong man who is obviously on the wrong ark and path to self destruction and sedition. “Our democracy is under attack and imminent destruction. “Our democracy in fact has been hijacked by a few privileged persons for personal political and economic gains to the detriment of the entire country. “This act of anti social and political treason and moral destruction sadly is championed by no other Nigerian but the President of the Senate, Dr Abubarkar Bukola Saraki. “We are saddened as Nigerians because this is the same man who had his father benefit maximally from democracy and her dividends. “This is the same man who had his father serve as senate leader, this is the same man who had benefited from stable democracy as a two term governor , senator and now Senate President. “Indeed, if there’s anyone who should uphold the tenets of democracy in this country, it should be Dr Saraki. But unfortunately, he has chosen the inglorious part of leading a pack against the whole country just to massage his ego and serve his own selfish purpose. “Of course he needs to understand that Nigeria is bigger than the Saraki estate bequeathed to him by his late father. “He needs to understand, that people have paid the supreme price for democracy to be introduced and established in this country. “Saraki needs to appreciate that he has been allowed for too long to reap from a system that he has not added any value over the decades. “Quite frankly, I am inclined to state here that the Saraki family as led by the current Senate President is among one of the most greatest benefactors of democracy in Nigeria. To understand why he cannot appreciate this with a little dose of patriotism is a puzzle. “To this end, we are gathered here to chronicle the moral epilepsy of the Senate President before Nigerians so as to justify the call for his imminent removal from office as Senate President so that democracy will be salvaged in our great country .